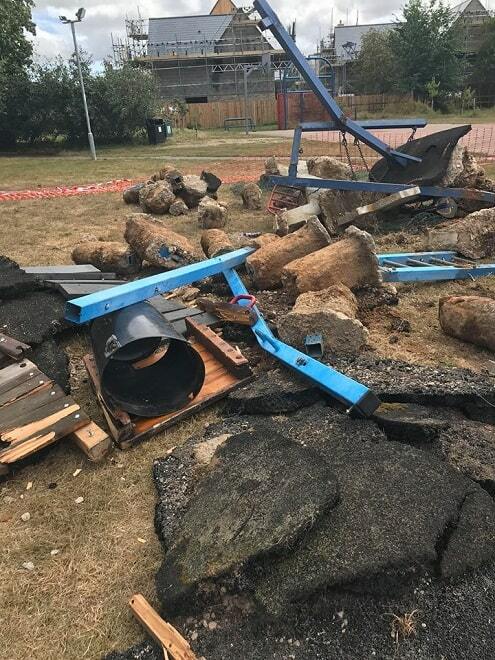 A complaint is said to have been made to the Health & Safety Executive claiming the play area at Bell Meadow has been left in a ‘dangerous’ state following clearance of old equipment from the site. The area was closed off for the removal of the playground equipment from July 6 in preparation for the construction of a new play area. St Nicholas-at-Wade and Sarre Parish Council say although the equipment was safe to use it had not met modern health and safety standards for a number of years according to a ROSPA (The Royal Society for the Prevention of Accidents) report. But Mark Sanders who is a parish councillor but was not acting on behalf of the authority, says he made a complaint to the HSE yesterday (July 31). 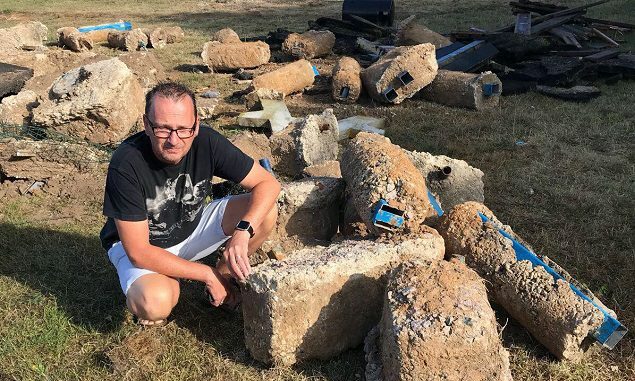 He said: “This (removal) has been done in a very unsafe manner leaving multiple pieces of exposed and broken metal, wood and concrete as well as deep holes in what was the playground. “The old metal slide and swings have been left without any meaningful and secure fencing – there is orange tape which is just laying on the ground – and there are no warning signs pointing out the danger. “This was started a week ago and is still in a dangerous state. Additionally there are no lights on Bell Meadow so at night the entire area is in complete darkness making it even more unsafe. “Several members of the village have raised their concerns with me due to the ongoing risk posed to members of the public, in particular children and any dogs which frequently are walked in the area. But the parish council lead for the project, Rob Searle, says the site has been cleared with the last of the concrete pieces expected to be removed today by a construction company. Cllr Searle says a previous complaint was made via Streetscene but the community warden, who is also working on the project, visited and found no issue to be resolved. Parish council chairman Gordon Bryant reiterated that the site would be cleared. He said: “I can confirm that the last of the waste matter will be cleared by Friday afternoon at the very latest so that the construction company can come on site on Monday. “I accept that this site clearance has taken longer than we hoped but it has been done by a small group of volunteers who should be applauded for their efforts. Cllr Bryant said he had not been made aware of a complaint to the HSE. The new equipment is due to be installed next week with a ‘grand opening’ planned for later in the year. Surely there are guidelines to this sort of work in public places. It’s great that there are enthusiastic volunteers who want to help but if poorly supervised or equipped then more damage than good can be done. Why is this being done in the middle of the school holidays when there are children playing. Whoever is in charge of organising this shambles should be taken to book. Shame on the parish council for not taking more care. Like hell this building site has been fenced off safely! Our Parish Council failing again but this time in spectacular fashion! From driving mowers into walls to harassing villagers in public spaces, In my opinion I can say I have never had the displeasure of such a group who are bottom of the class. I would say resign but don’t waste the effort! This lot are so unpopular they will be out by next election!! I should be the chairman of the pc. As I have brought this to everyone’s attention so it shows I know what I’m talking about. And the playground would be even better with me in control.